Two years after the Battle of Bosworth and the victory of King Henry VII the last battle of the Wars of the Roses took place. On 16th June 1487 at Stoke Field King Henry VII and the Lancastrian army took to the field against the remaining Yorkist army. 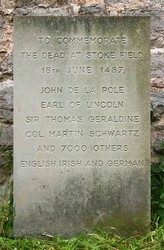 The battle saw the Yorkists place their hopes on a man called Lambert Simnel who had come to the attention of the Earl of Lincoln, John de la Pole. Simnel was claiming to be the nephew of King Richard III and the son of George, Duke of Clarence and therefore the rightful heir to the throne. Simnel had gathered support abroad after fleeing to the Low Countries and the court of the Duchess of Burgundy, his aunt. 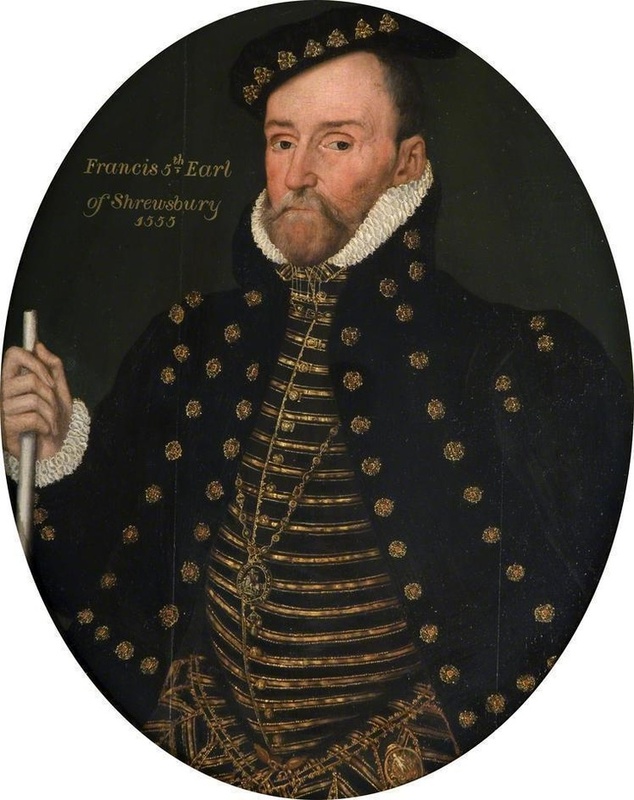 Here Simnel gained the trust of Thomas David, captain of the English garrison at Calais, Sir Richard Harleston, former governor of Jersey and most importantly Lord Lovell, Richard’s most trusted aide. With some of the most loyal Yorkist supporters behind him they set said for Ireland to gather even more support. Simnel and his followers landed in Dublin on 4th May 1487 and quickly gained even more support from the Irish. It was here on 24th May that Simnel was crowned King Edward VI. With this the army set of with England and the throne in their sights. They landed on 4th June and found their army stood at approximately 8000 men. Just days later Lord Lovell led 2000 of these men on a late night attack against a small Lancastrian army of just 400 men led by Lord Clifford. Unsurprisingly it was a Yorkist victory. Following a skirmish on Bootham Bar, York John de la Pole and the army continued south and just outside of Doncaster they fought with the Lancastrian army that was being led by Edward Woodville. Fighting continued for three days through Sherwood Forest as the Yorkist army forced Woodville and the Lancastrians back towards Nottingham. It was in Nottingham that Woodville waited for the rest of the army to join him, it was on 14th June that Lord Strange arrived with reinforcements as well as Rhys ap Thomas with support from Wales. Now King Henry VII’s army was bigger and better equipped than the Yorkists. The following day on 15th June Henry and his army headed for Newark but it wasn’t until the 16th when they had caught up with de la Pole and the Yorkist army. At 9am the Earl of Oxford encountered the Yorkists on the top of Rampire Hill. They were surrounded on three sides by the River Trent and were just by the village of East Stoke. Some Lancastrian soldiers deserted the army after misinterpreting lights in the sky as a sign of things to come but Oxford quickly bought the remainder of the army back together and readied them for battle. The Battle of Bosworth had taken place on two years previously and Henry followed a similar battle plan and let the Earl of Oxford take control of the vanguard as well as the direction that the fight would take. The Lancastrian army would be separated into three distinct battles whereas the Yorkists attacked in a single formation. After coming under arrow fire from the Lancastrians the Yorkists abandoned their high ground and attacked in the hope of breaking the opposition apart. Oxford’s vanguard was left shaken after the Yorkist attack but it regrouped and the battle continued for the next three hours between the vanguard and the entire York army. With the vanguard holding strong Henry took the decision not to send in the other two attack groups. The vanguard had experienced longbowmen and with the lack of armour in the Irish troops the Yorkist army was cut down in size quickly. With the Lancastrian vanguard in front of them and the River Trent surrounding them the Yorkist army had nowhere to retreat. Many were cut down on the field but some fled towards the river in hopes of escape only to be cornered and killed. All the Yorkist commanders were killed except one, Lord Lovell. Lovell disappeared after the battle and was never seen again. It is believed he escaped to Scotland as there is evidence that safe passage was granted to him. However, a body was found in the 18th century in a secret room inside Minster Lovell, his home in Oxfordshire and although never formally identified many believed it to be Lord Lovell’s body. After the battle Lambert Simnel was captured and Henry realised that he was nothing more than a Yorkist dream and therefore Henry pardoned the young boy and found him work in the royal kitchen where he was later promoted to falconer. The Irish nobles were also pardoned in order to keep them on Henry’s side in the future. This was the last battle to take place between Lancastrian and Yorkist armies.